Practice the math worksheet on number names from one to forty and help the kids to write both in numerals and in words. The worksheet is divided into two parts so that children can get educational fun in the process of learning numbers from 1 to 40. Parents and teachers can help the children to learn numbers thoroughly by dictating the numerals here and there from 1 to 40 to make sure that kids can recognize the numbers and by listening the dictation they can write the exact number in the space provided in the worksheet. 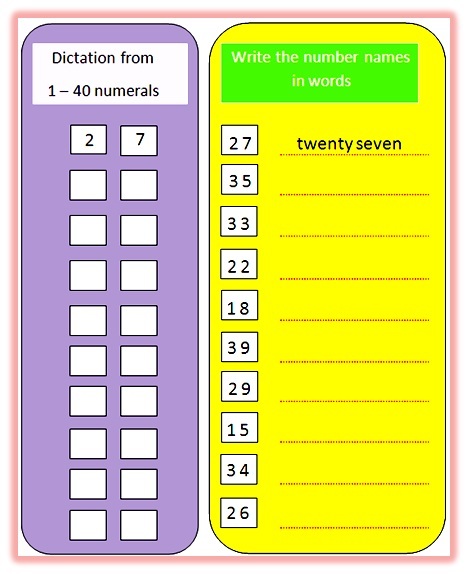 In the other part of the worksheet kids need to write the name of the numerals in words of the given numbers. Children can practice math games worksheets on number names from one to forty by using pencil. (i) Beginners, preschoolers, primary and elementary kids try to complete the worksheet within 18 minutes. (ii) Kindergarten kids needs to complete this within 10 minutes. 27 – twenty seven , in the example we see number 27 is given in the worksheet kids need to write 27 in words as “twenty seven”. So spell the number names in words to complete the worksheet.